1.This machine si adopting the atmospheric system. It’s equipped with the rotation table which will make a rotation by it self when printing, in order to avoid the problem of “wrinkle”. 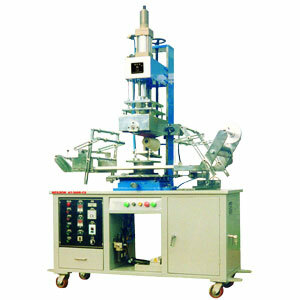 2.When roller pressuring the switch in the contact cup edge make the cup transfer printing synch ronizily while the rotary mechanism is moving. In the process of transferring,the cup rotates by the edge wrapping paper. 3.This machine could adjust the degree of the rotation base on the taper of the printing object. 4.This machine could adjust the stroke base on the external diameter of the printing object. 5.This machine equipped with the double section cylinder, which could provide the steady printing. 6.All electric components are imported from Taiwan.